1. Make your kitchen shine. Even in our fast paced fast food society, with its concomitant de-emphasis on home cooking, the kitchen is still the spot home buyers make a beeline for when they first view a home for sale. Whatever you can do to enhance this room will reap dividends. For a few hundred dollars, you can replace the kitchen faucets, add new cabinet door handles and update old lighting fixtures with brighter, more contemporary ones. If you’ve a slightly larger budget, you should give the cabinets themselves a makeover. Rather than spring for a whole new cabinet system, which can run into the tens of thousands, consider resurfacing or re-staining or painting them to make your kitchen the buyer magnet it needs to be. Though the price of homes in our market has improved significantly, it is still not yet fully recovered and the general economic climate has given birth to many new companies dealing in restoration – take advantage of them. Replacement cabinet doors and door fronts are easily obtained from big box stores such as Lowe’s and Home Depot, and from several specialty stores. A few years ago they were available at the Simpsonville Flea Market of I64. If you don’t have two left hands, installing them yourself is fairly simple. Consider replacing your vinyl counter tops with granite if you have a higher end home where granite is de rigueur. You won’t get back the cost of installation, but you’ll probably sell your house faster. 3. Brighten your bathroom. Next to the kitchen, bathrooms are often the most important rooms to update. You’d be surprised how inexpensive fixes such as a new toilet seat and a pedestal sink, which are simple to install, give your bathroom a new modern look. Do you have those dated bathroom tiles? You know, the ones that shout “1980” as soon as you walk in. I firmly believe that attractive new vinyl (you can get some that are very difficult to distinguish from ceramic)) is way better than ugly boring old ceramic. And another big plus is that its very easy to install and you can often do it right over the old tile. No question about it, new ceramic beats new vinyl, but if your budget demands it, go with vinyl. You’ll find that one-piece vinyl wall and bath units, which require professional installation, is probably cheaper than re-tiling walls and refinishing a worn tub. But definitely consider having your bath refinished instead of replacing it, if the bath’s wall tiles are in acceptable condition. 4. Increase your storage. Houses built prior to 1990 will often have closets the size of suitcases. Definitely not appealing to today’s buyers. And somehow areas set aside just for storage seem to be the builders’ last thought. But what to do? One solution is to add wire laminated closet systems which are easy to install and which add considerable space to cramped bedroom and pantry closets. Firms like ClosetMaid, EasyCloset and Ikea have software programs enabling you to measure and plan your closets’ interior online. But sometimes you can find these brand name systems or similar cheaper on sites like Amazon or even at Walmart. 10-15 hours should be enough for a few closets. If you go to the trouble of doing this, make sure you put it on your feature sheet or brochure and mention it in the listing details. Everyone loves more storage! 5. Add another bedroom. I have an investor client who buys only 4 bedroom homes. He has 31 of them and last year he gave up his day job to manage his rental portfolio. I have another investor client who buys 3 bedroom brick ranches only, but looks for those where the plan and plat will allow him to add a fourth bedroom. Both these investors report that there is a huge demand for 4 bedroom houses and that their homes are rented quickly. And my experience as a Realtor supports their conclusion. Fourth bedrooms are desirable. Now I’m not suggesting that you physically add square footage to your house. But if you have a three bedroom house with a den, and the only thing preventing you from calling it a bedroom is that it has no closet, or maybe door, consider adding them. And the closet can be one you buy from a yard sale. If you have a basement and can turn part of the area into a bedroom, consider doing so. You may run into technical problems with whether you can legitimately call the room or area you are converting, a “bedroom”. The Greater Louisville Association of Realtors uses the The American National Standards Institute (ANSI) standard for determining such things as the correct way to measure a house, whether to count the air above an open staircase as “finished square feet” and when a room can be considered a bedroom. Consult with your Realtor who will be able to help you with this. Remember, when people are doing an MLS search and are searching only for 4+ bedrooms, your 3 bedroom house will not even blip onto their radar. 6. 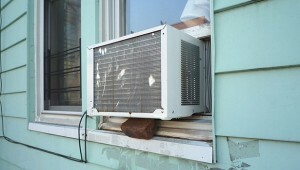 Help your HVAC. If there’s a dead give-away that you have an inadequate HVAC system, its an ugly, noisy window A/C unit protruding from the 2nd story bedroom window. This can be a deal killer. Here are some inexpensive ways to to keep your house cooler using your existing HVAC: (1) Add ceiling fans which weill make you feel between 3 to 8 degrees cooler (2) insulate your ceiling and seal those cracks in your doors and windows (3) Use drapes. Direct sunlight can raise a room’s temperature by between 10 to 20 degrees. Drapes block sunlight and heat much more effectively than blinds. (4) Use CFL and LED lights. 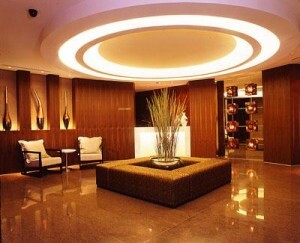 Lights generate a lot of heat which your A/C system has to remove. So replace your incandescent lights with compact fluorescent (CFL) bulbs, which use 75% less energy and create 70 to 90 percent less heat. Incandescent lights emit 10% light and 90% heat, while CFLs do just the opposite: they emit 90% light and 10% heat. So using less light not only saves on your electric bill, it also reduces the amount of heat generated in your home. 7. Clean that Carpet. A professional carpet cleaning is relatively inexpensive and deals are often to be had. Look at the back of your yellow pages for a coupon and keep your eye open for Groupon carpert cleaning specials. If you’re a do-it-your-selfer, Home Depot will rent you a professional carpet cleaning machine. It’s inexpensive investment, especially if your rugs are in good shape and are neutral colors. If your carpet is worn in spots, consider covering it it with inexpensive, strategically placed area rugs. And if its catastrophically ugly, buy a neutrally colored inexpensive carpet. It’s definitely not a good idea to put in expensive hardwood (or expensive carpeting). A friend recently did that 6 months before he sold his house. It cost him a small fortune to convert to an “all hardwood” home. The new owners covered every inch of it with wall to wall (hideous floral green) carpet! 8. Let there be light. Yes, yes, yes! Recessed lights are great! But if you want to stand out from the crowd, and can spring a few hundred dollars try a sparkling chandelier or two in your home – you can sometimes find them for 10% of value in Craigs list. Lowes and Home Depot offer a fairly wide range, but don’t stop there. There are many other stores in the Louisville area offering great prices on light fixtures. And if your energy conscious ways have induced you to put ceiling fans in your rooms, consider buying updated, shining new replacement blades. 9. Deal with your door. Chintzy hardware on your front door tells your buyer “hey you think this door handle’s flimsy – you ain’t seen nothing – come on in and I’ll show you what REALLY cheap looks like” So breath deep, hold your breath, and go splurge on a heavy, good looking handle-and-lock set. According to a national survey of Realtors a few years ago, the biggest return on investment was reported to be on replacing the front door with a newer, attractive one. Consider doing that. And even if you just have a basic steel front door, make sure it’s clean. Consider repainting it to give your entrance a bright fresh look. 10. Curb appeal counts. Spooky looking houses are great for Halloween, but they just don’t sell well! You only have one opportunity to create a good first impression, so be sure to keep your front lawn mowed, your mulch thick and lustrous, and consider planting some bright flowers to create an attractive picture for he drive buy potential buyers. And your neighbors will love you for it!